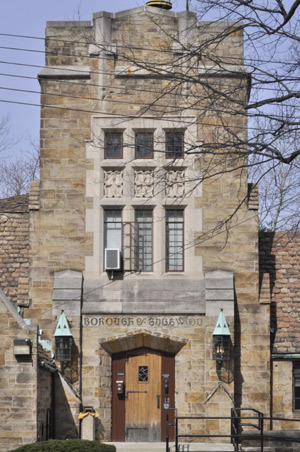 The Borough of Edgewood has been designated an historic district by the Pittsburgh History and Landmark Foundation. Dec. 1, 1888 Edgewood Borough Incorporated. Mar. 8, 1890 Edgewood's first election was held at the Edgewood Grocery House. 1890 S.W. Dermitt, was appointed Edgewood's first Postmaster and Tax Collector. 1891 Edgewood's first school, a four room brick building, was erected. Dec. 17, 1891 Edgewood Presbyterian Church organized. Sep. 20, 1892 Cornerstone was laid for first edifice of Edgewood Presbyterian Church. Oct. 6, 1892 Edgewood School opened. May 28, 1893 Dedication of Edgewood Presbyterian Church. 1898 Spanish American War troop trains went through Edgewood. Dec.
1899 School for the Deaf destroyed by fire. 1900 Edgewood Civic Club organized. Mar. 12, 1900 School for the Deaf reopened in temporary buildings. 1901 President William McKinley's funeral train passed through Edgewood. May 6, 1901 Cornerstone laid for new building for School for the Deaf. May 14, 1903 Dedication of new building of School for the Deaf. Jul. 2, 1904 Charter of Edgewood Club approved. 1905 Brick and shingle Station House erected. 1915 Edgewood Cot Club organized. 1918 C.C. Mellor Memorial Library opened. 1932 Stone Municipal Building on Race Street constructed by Erik Lawson. Won a national award for beauty of design - Clifford Lake, architect. Dec. 15, 1938 Fiftieth Anniversary of Edgewood Borough. Feb. 25, 1940 Edgewood Garden Club organized. Jan. 6, 1944 Edgewood Historical Society organized. Oct. 13. 1944 American Legion Post organized. Dec. 1, 1988 100th Anniversary of Incorporation of Edgewood Borough.